What is the Ribbon Workbench? 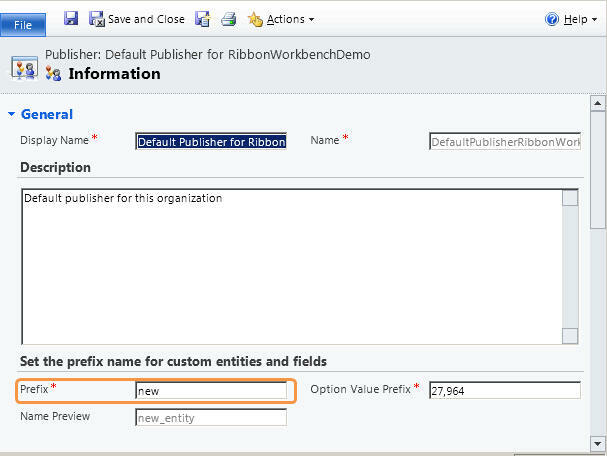 The Ribbon Workbench for CRM is a tool written to make customizing the Ribbon easier and quicker. 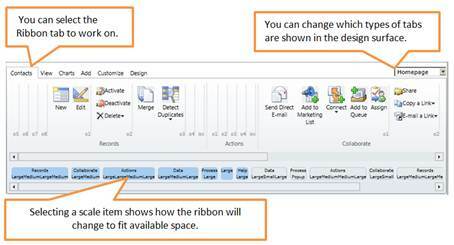 The Ribbon is the user interface element that appears at the top of all recent Microsoft Applications, and was the successor to the old ‘toolbar’. Rather than have a single toolbar that was full of all command buttons and a set of drop down menus that could be multiple layers deep, the Ribbon attempts to show only the commands that you need depending on the task that you are doing. The ribbon also attempts to scale to the available window width, making some less important commands smaller or even move them to drop down menus when the space is limited. The ribbon designer decides on the importance of each command and therefore the order in which commands are ‘demoted’ as the window width is reduced. 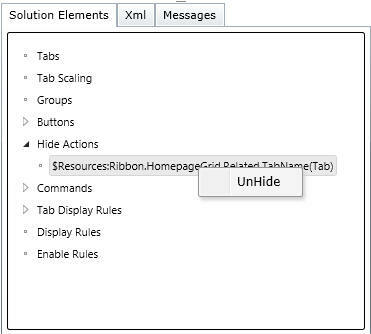 Before the Ribbon Workbench, there was the CRM2011 Ribbon Visual Editor that allowed the simple addition of buttons and groups to existing tabs, but any more complex scenarios such as drop down menus, changing the ‘out of the box’ ribbons or adding new tabs was confined to the realms of editing page upon page of hard to understand xml. The Ribbon Workbench for CRM was written to provide a ‘drag and drop’ developer experience that allows all customization scenarios to give complete control over your CRM ribbon & command bar! 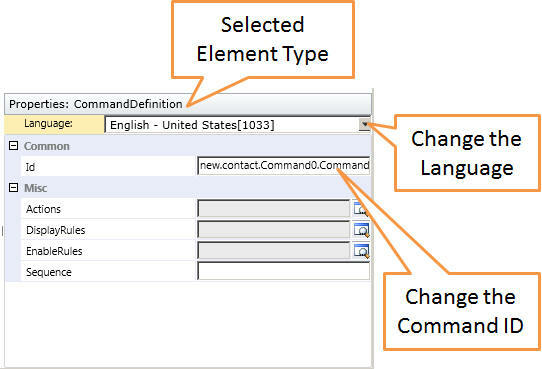 Note: Although CRM2013/2015 has the command bar - the underlying mechanism still has the Ribbon structure and so we still talk about the Ribbon in this article. 2. Download the Ribbon Workbench, and then select the downloaded solution file and following the instructions. 3. Once imported, you can click the ‘Ribbon Workbench’ button on the ribbon. This button is only visible if you have customizations rights and you are in the ‘Solutions’ area. 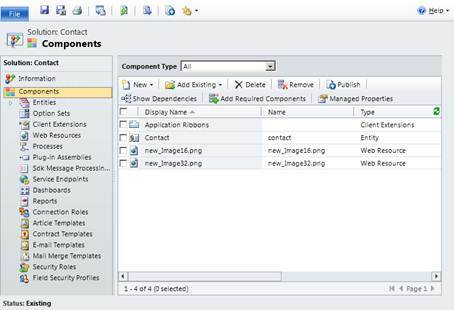 If you wanted to add a button to the Contacts Form Ribbon (the form shown at the top of the form when editing a Contact), you would add the Contact entity to a solution and load it into the Ribbon Workbench. If you wanted to add a button to all Form tabs for all entities you would add the Application Ribbon to a solution. 2) Enter the name of the solutions (e.g. 'Contact') and click 'Save'. Webresources are simple files that can be uploaded into a solution that can be used by your customizations. Later on we'll see how you can use webresources to provide scripts that can be executed via buttons on the ribbon, but for now we'll concentrate on simply adding an image webresource. Since we are going to create a new button on the ribbon we’ll need some pretty images to put on them. Ribbon buttons require two images of type png, gif or jpg. The two sizes are used when the ribbon resizes to fit the available window width. If there is limited space, a button can change into a smaller button or become a drop down menu. Here are two example button images of the correct size that you can use. You can create these images in any image editing package – a great free tool is Paint.NET. 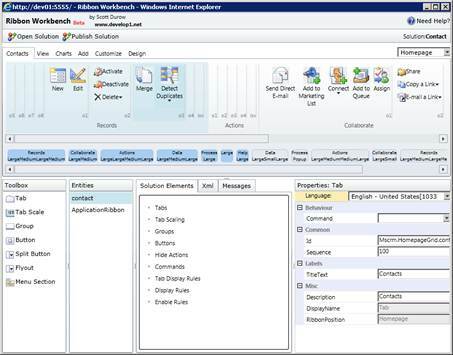 Now go ahead and open the Ribbon Workbench from Settings→Solutions→Ribbon Workbench and when presented with a list of solutions, select your newly created solution named ‘Contact’. You should be presented with a view of the ‘Home Page’ ribbon of the contact entity. Before we look at the different parts of the Ribbon Workbench, go ahead and have a play - nothing is saved until you click 'Publish Solution'! The Ribbon Editor Panel provides the main design surface for editing the currently selected entity ribbon. Each ribbon is divided into different tabs. When you select the Application Ribbon you'll see many more tabs that if you select the 'Contact' entity. A really import thing to notice at this point is that here are a number of different types of ribbon tabs that can be edited by selecting from the drop down in the top right of the Ribbon Editor Panel. 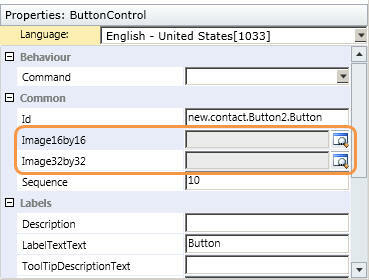 Homepage – Tabs that are displayed in the main CRM 2011 application screens. Form – Tabs displayed when a specific record form is opened. SubGrid – Tabs shown when a list view is selected on a specific record form. Jewel – The menu options that available when the ‘Jewel’ is selected. This is the blue ‘File’ tab that is show on the left hand side of the Homepage ribbon. These are only editable when the ‘Application Ribbon’ is selected. Try selecting different types of ribbon and see which tabs are shown. You'll notice the panels shown under the Ribbon Editor Panel. You can select the divider bars between these panels to resize them to the position that suits you best. Toolbox Panel - The toolbox allows you to drag and drop ribbon controls on to the ribbon design surface. When you drag an item it must be positioned next to where you would like it to appear. The cursor will change to a blue plus icon when dropping the control is allowed. If you want to place a new tab, you must drag the tab control directly next to an existing tab, rather than drop it where the controls appear. Solution Elements Panel - This panel is one of the most important areas for understanding your ribbon customizations. 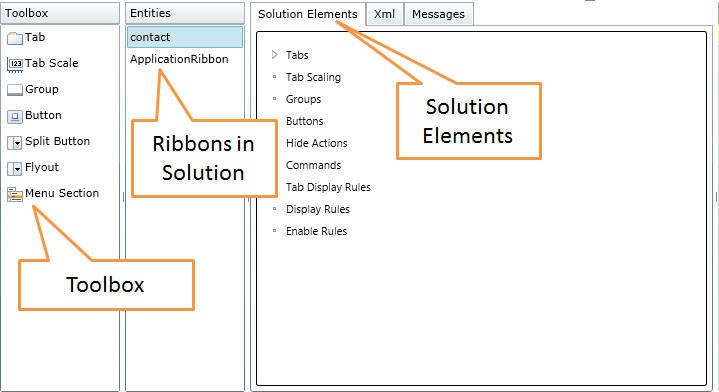 As you drop items on the Ribbon Design Surface, Custom Actions will appear in the Solution Elements. Later we will look at what each of these elements mean. 3) Drag a button from the toolbox onto the 'Records' ribbon group. Try dragging the button to different places - you'll see that some places will show a 16x16 button and some places will show a 32x32 button. 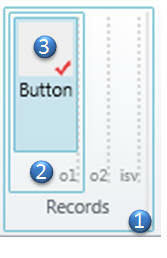 This is because the Ribbon template defines the size of buttons in each layout area within each group. At this stage we should take a look at how the ribbon is made up. Layouts - Each Group is sub-divided into multiple Layouts which then contain controls that are all shown at a particular size. Each Layout is assigned a different size by the template layout that is selected. More on this later. Controls - The Controls are positioned within each Layout. When the ribbon is shown to the user, they can't see the different layouts, only that in each group, there are buttons shown at different sizes. Whenever a ribbon is part of the loaded solution it will show a red tick ( ). It is important to understand here that you can customise out of the box ribbon elements, or add new ribbon elements. In both cases the elements will have a red tick on them since they are included in the solution. If you customise an out of the box group or add a new group, a red tick will appear on all of the buttons in that group. If you customise or add a new tab, a red tick will appear on all of the groups and buttons in that tab. If you remember earlier we added two images to our solution for use on our button. We can now specify these by selecting our Button and using the Property Panel. Click the search icon on the Image16by16 and Image32by32 Property and select the corresponding image from those in the solution. The Ribbon Workbench only shows webresources selectable if they have been added to the solution currently loaded. Go ahead and drag your new button around on the ribbon to see where it can go. You'll notice that in some Layouts it will show as the 16x16 button, and in some it'll show as 32x32. At this point you may also like to change the LabelText from 'Button' to something like 'Open Bing' using the 'LabelTextText' property. You will notice that you can change the Language using the drop down box at the top of the Properties Panel. The available languages depend on those that you have provisioned inside your CRM Organisation. Now we have a button, the next item on our TODO list is to define what happens when the user clicks it. There will be much more on this later, but for now, we'll simply make it open a new IE window that contains a Bing search page. 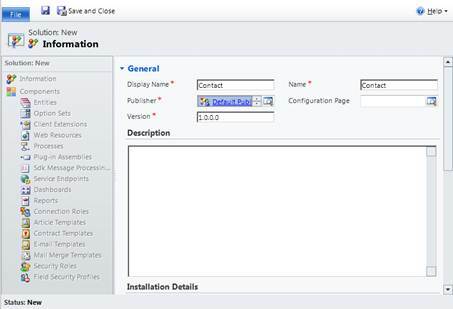 The prefix can be changed to your choice by using the Information Tab of your Solution and selecting the 'Publisher'. The Prefix can be edited and saved. For this to take effect in the Ribbon Workbench, you must re-open your solution. 3) You have the option of changing the ID using the Properties Panel. This Panel will show the properties of which ever element you have selected in the Workbench. The Ribbon Workbench creates a consistent naming convention for your ribbon elements, so it's advisable to only change the Command0 bit. The WinParams is a string that has a structure depending on the WinMode. 7) Now that we have oure command, click Ok, and the select our new button in the ribbon. The Properties Panel should now show the Properties for the ID. You could rename the button ID if you liked at this point. Now that we have everything setup, we can publish our solution to make the user interface available to the user. To publish, simply click on the 'Publish Solution' button on the Top Bar. The publish may take a little time depending on how much resources your CRM Server has been allocated, but once finished, you should be able to navigate to a Contact record and use the new button. To avoid these warnings you can select your button and provide some text for the 'ToolTipTitleText' and 'ToolTipDescriptionText' properties. The Ribbon Workbench will always download the latest entity customisations (attributes, forms, webresources etc.) before publishing your ribbon customisations so any changes that have been made since you opened the solution (other than ribbon changes) will be preserved provided they are not published in between downloading and re-uploading. If you have multiple people working on your solution, you need to be careful that two people are not publishing their customisations to the ribbon at the same time since the last person to publish will overwrite the ribbon changes of the previous person. If you wanted to remove the button that you've just added, you can simply 'Right Click' on the button either in the ribbon, or in the Solution Elements Panel and click 'Un-Customise Button'. You may have noticed that whenever you drop an element onto the ribbon, it shows up in the Solution Elements Panel so that you can keep track of what you have customised. If you select the button in the Solutions Elements Panel, the button in the ribbon is also selected so that you can easily find it, even if it's on a different tab type to the one currently selected (Form, Home Page, Sub Grid). 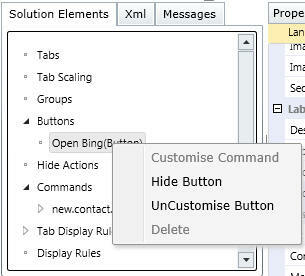 1) Select the Button or Tab that you would like to hide, and select 'Hide' from the 'Right click' menu. You will notice that the element now has a red-line through it, indicating that it will be hidden. At any point you can then use 'UnHide' in the same way. 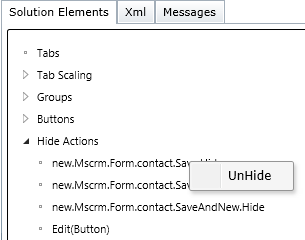 Just as with new buttons appearing in the Solution Elements, when you hide a ribbon element it appears in the Solution Elements as a 'Hide Action'. In this chapter we have learnt the basics of using the Ribbon Workbench, adding a new button, associating it with a command, and publishing the solution. We also looked at hiding ribbon elements and how to unhide them. In the next chapter we will look at the different types of Ribbon in a bit more depth so that you can understand where you need to make your customisations.